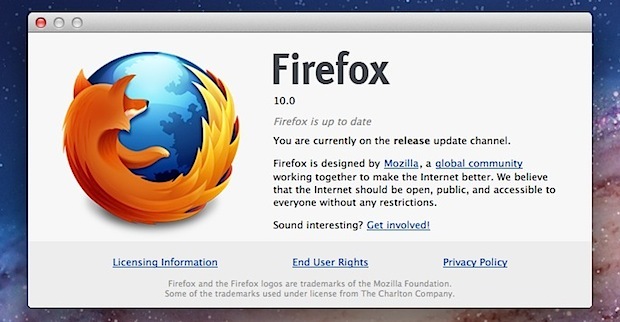 Firefox 10 has been released and is available to download for Mac, Windows, and Linux users. The new version isn’t too different from version 9, but includes bug fixes, better extension management, an auto-hiding forward button, improvements to CSS3 capabilities, and antialiasing support for WebGL, as well as some other additions that the average user probably won’t notice. The release notes are posted below for those interested, otherwise just download and enjoy. Unfortunately, the browser is still lacking the now standardized OS X Lion full-screen button, and the 10.0 release didn’t include any new Mac-specific features. All in all, for a 10.0 release it’s kind of boring, but you can make it more attractive by giving it a Google Chrome style Omnibar with this add-on for Firefox that merges the search and URL bars into one. I can’t believe they’re calling this Firefox 10… I mean it’s a great browser but these are minor changes. Another Firefox yawn, wonder how many plug-ins are broken with this release to go with the broken Growl notifications? Firefox lost me at version 9 when for what seemed like the 4th version in a row too many of my favorite plug-ins stopped working. Yeah I know the developer needs to make the plug-in compatible, but if there weren`t releases ever month, it would be easier for them to keep up with the changes. Swiping left and right with 2 fingers on OS X Lion as in Safari now works in this browser. … and it won’t work on my GF’s PPC iMac. I realize it’s been a while since the Intel Macs arrived but why do Firefox, Skype et al practically force us to download new versions that aren’t for our platform of choice? Naturally, they aren’t Universal and I have to go fishing the older version out of the Trash – if I’m lucky. In that case, Firefox shouldn’t try to update the PPC version. That Warragul above states that he had to fish the old version out of trash means that FF did try to update a PPC version with one which doesn’t work. from a non-privileged account. They had addressed this one in a previous release, but the old and wrong behaviour is back again. “The now standardized OS X Lion full-screen button” does a horrible job with multiple screens as it blanks out the other screens and yet it has no option of expanding the window onto them. In general multiscreen/multidesktop support in Lion has been a step back from Snow Leopard and this is kind of ridiculous. the link for Chrome style Omnibar add-on is incorrect, it points to Firefox download, could anyone fix it? Is it a 100% Cocoa app now that supports Services? If not, won’t bother.